Improvements to the brand new All-in-one template and single-sign-on via oAuth 2.0 in Easygenerator courses! Learn all about the most recent features and enhancements that help you share your knowledge more effectively. Your logo is the face of your brand. Here at Easygenerator, we care about branding your content; we believe that it not only makes a memorable impression on your clients or employees but also allows them to know what to expect from you as a company. With the upcoming updates in March, we will be adding an option to define not only the regular logo that will be displayed in courses you author, but also an alternative logo that can be used to make sure it looks good on any type of background. Also, it’s now up to you to decide if you want to have your logo on every page of the course, or maybe just on some pages to make the look and feel more minimalistic and neat. Full HD and high-resolution displays like retina are quite common these days and it’s important to make sure that people enjoy viewing content on any screen, from small mobile screens to large 4K and 5K displays. So with the latest updates, the All-in-one template boasts better spacing, layout, and readability on large screens. Like in the Simple Course and Assessment templates, it will now also be possible to set a mastery score in the All-in-one template. You can choose between a mastery score per section or for the entire course. When the mastery is set per section, the overall score is calculated by adding the score reached per each section and dividing by the number of sections in the course. To successfully pass the course, learners have to achieve the mastery score (80% in this case) per each section. For example, if a learner gets less than 80% for at least one section, the course will be failed. The score can be seen on the progress bar under each section icon. When the mastery is set for the entire course, the score will be averaged, meaning that even if a learner gets less than 80% for any section(s), but the overall score is still 80% or higher, the course will be passed successfully. SSO (Single-Sign-On) means you need to remember fewer logins and passwords, giving you an overall smoother experience using a tool or software. The ubiquitous “Login with Facebook, Twitter, Github, etc.” can be seen in almost every web app we come across. Tools like Auth0, Netlify Identity, Firebase, and Okta make it pretty simple to add these login buttons to most apps. This month we are excited to announce that oAuth 2.0 will be officially supported in Easygenerator courses. But what does it mean for you and your organization? 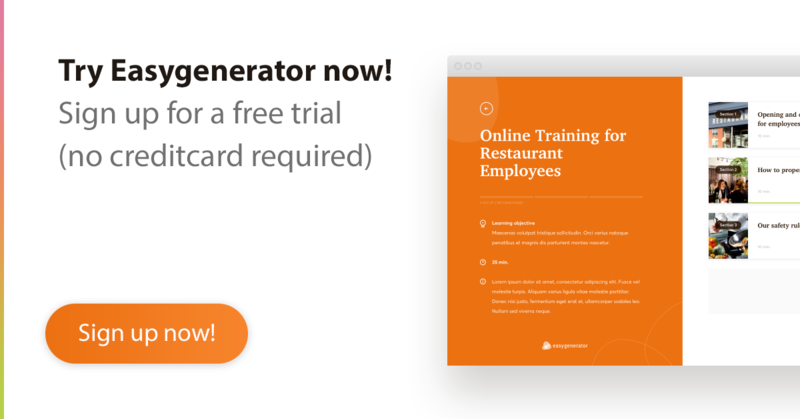 You now have one more option to establish integration between platforms on your side and Easygenerator courses. And, considering the popularity of oAuth 2.0, the chances that your platforms support it and can be easily integrated with Easygenerator courses are pretty high. 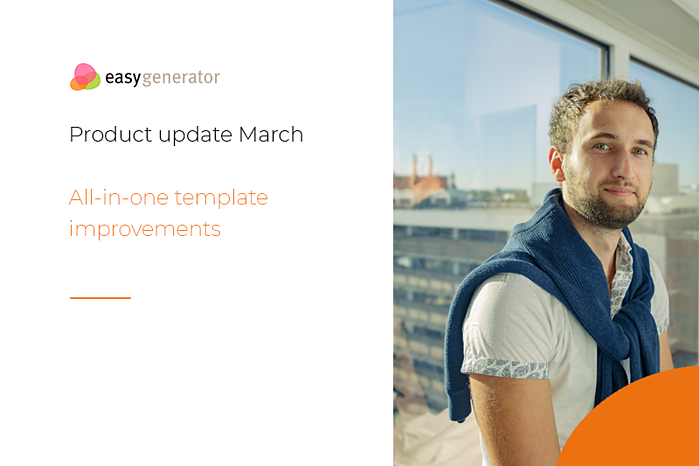 We will continue to work on polishing the All-in-one template and keep releasing improvements every week. One of the major improvements that can be expected in April is support of the external review feature. That's it for this month! If you like the update or have any questions, please let us know in the chat.